Mr. Tufts’s primary area of focus is defending employers and insurance carriers against claims arising under the Longshore and Harbor Workers’ Compensation Act and the Defense Base Act. Mr. Tufts receive a Bachelor of Science in Finance in 2012 from Louisiana State University. He received his Juris Doctorate from Loyola University New Orleans College of Law in 2015. While in school, Mr. Tufts served on the Editorial Board for Loyola’s Maritime Law Journal and served as a Judicial Extern to the Honorable Jay C. Zainey of the United States District Court for the Eastern District of Louisiana. 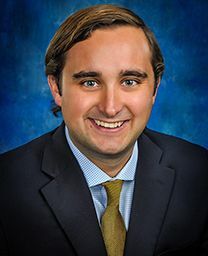 In addition to receiving his law degree, Mr. Tufts received a Master of Business Administration from Loyola University New Orleans College of Business in 2015. Mr. Tufts was admitted to the Louisiana State Bar in October 2015. He is a member of the Louisiana State Bar Association and St. Thomas More Inn of Court. Mr. Tufts is a lifelong resident of New Orleans and attended Jesuit High School.